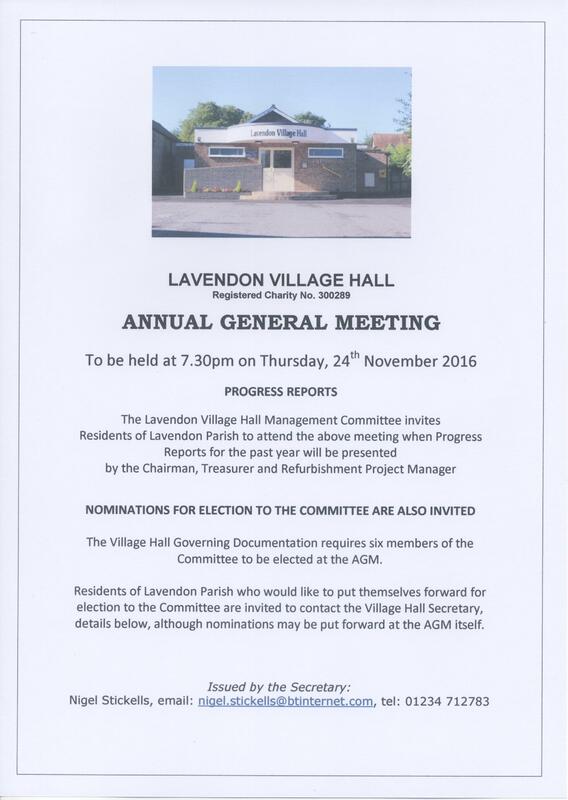 Lavendon Village Hall Management Committee will be holding an AGM on Thursday, 24th November 2016 at 7.30pm. There are likely to be two vacant positions (elected) on the Committee for those who would like to support the Hall and contribute ideas for its ongoing success. The Committee has an ambitious refurbishment programme and has raised and invested over £120k in the the past three years. If you think you could add some ideas in support of the Hall then why not come along to the AGM and consider joining the Committee, or get in touch with the Secretary – contact details as shown below. Posted on Sunday, 23 October 2016 by Editor •	This entry was tagged Community, Village Hall. Bookmark the permalink. ← Murder Mystery – Who Dunnit?